How do I refresh my ad and why do I have to? Just like the MLS, fresh content in your ads = more traffic! We understand... you worked hard on your ad content and don't want to change it. Job boards, however, like new and updated content because that's what job seekers like and respond to. The WizeHire system monitors the job boards and your ads daily. 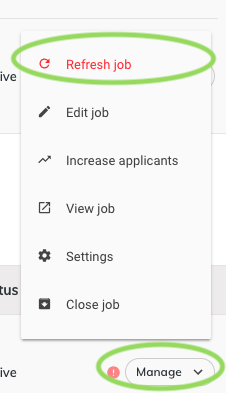 When we sense that a job posting is getting old or becoming less effective, you'll see your ad move to the bottom under the 'Poor visibility' category and it will have a red exclamation notification to the left of the 'Manage' dropdown menu. Making a change to the title or Job Description, adjusting the Compensation wording, and/or adding/removing a bullet or two in Responsibilities and Qualifications will get you there. If you make the changes suggested above, you should be able to move through it quickly. We also have templates available to give you some ideas. You may think it's easier to close and reopen your same ad a short time later. Bullet #2 in this blog post shares what Indeed thinks of that practice. Take 2 minutes, refresh your ad and get more applicants!